The Durham hotel originally housed a bank in Downtown Durham (315 E. Chapel Hill St.) and reopened in 2015. It’s quickly become not just one of the best places to stay in Bull City, but throughout North Carolina. At this hotel, you’ll find fabulous designs inside and outside, amazing service, and a focus on “local” for pretty much everything. That’s why a night at The Durham Hotel feels like you’re taking in a giant gulp of the Tar Heel State. And those are just a few of the reasons we’ll be back and why you will be after staying here, too. Keep reading and dig into more with me. The Durham made our list of favorite hotels in North Carolina. We’ve also included it in our guide to a weekend in Bull City! 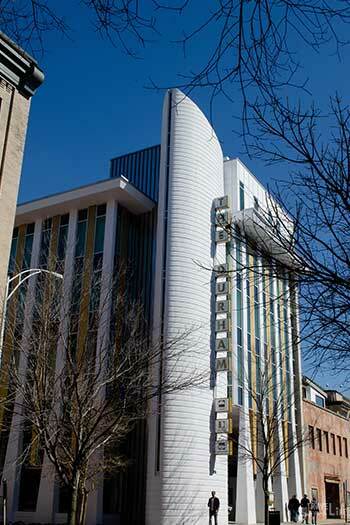 The Durham was originally designed and completed as Home Savings Bank by Perry C. Langston in 1968. The building was ahead of its time when finished, but still catches eyes today. Its angled tower, geometric siding, and retro interior design have stood the aesthetic test of time. And that’s a tough task as newer buildings continue to spring up around Durham. The Durham features 53 guest rooms, a meeting space, and breathtaking 360-degree views of the city from the Roof. 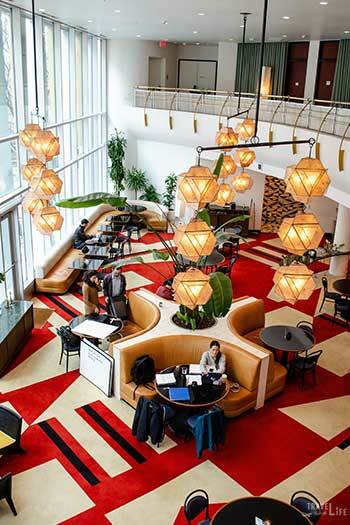 The lobby is outfitted with a geometric patterned carpet, sleekly swooping mezzanine, and floor-to-ceiling windows. 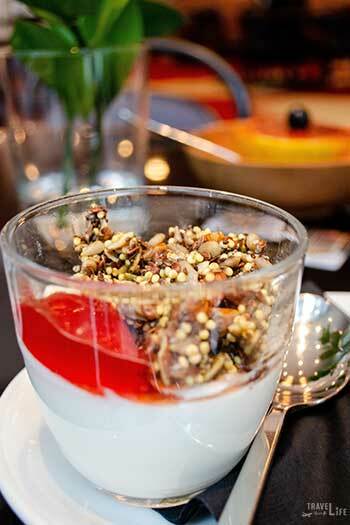 There’s also a coffee shop, raw bar and American-style restaurant run by James Beard Award-winning chef Andrea Reusing. 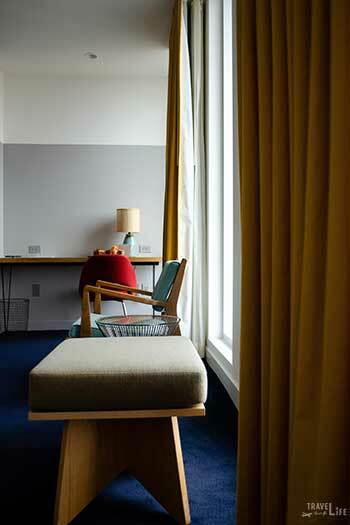 Mustard yellows, bright reds, and deep navy blues make up the hotel’s color palette, steeping The Durham in mid-century design while paying homage to the local community. 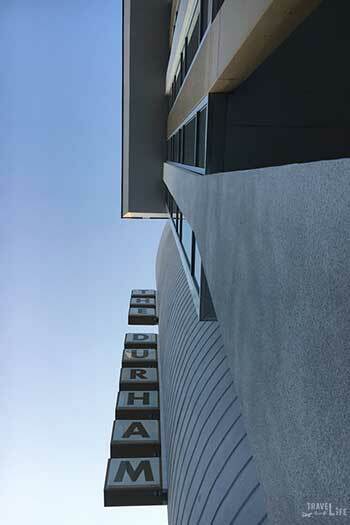 If you’re already convinced, go ahead and book a night (or more) at The Durham. You can compare pricing here, but we recommend you go directly through their website. Inside my King Superior Room. No room at The Durham Hotel is better than another, unless you’re going Suite or Penthouse. Each one comes packed with amenities and local selections that help guests feel at home. My favorite example is their wooden platform beds that are dressed in Raleigh Denim bedding. Beautiful floor-to-ceiling windows and soft lighting will allow relaxing views of the city from your room. You’ll want plenty of time to sip your morning coffee or evening glass of wine. Locally roasted Counter Culture coffee is ground each morning and placed at your doorstep waiting for you when you wake up. 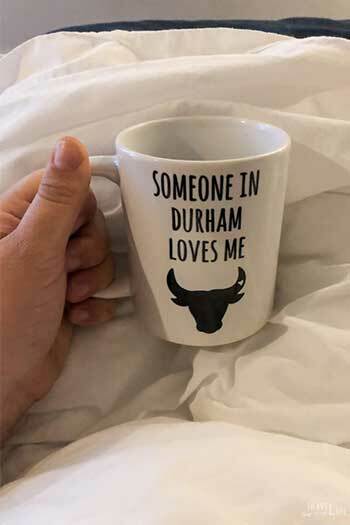 Adorable coffee mugs from The Bulls of Durham remind you that Durham really is a place of love and unBULLievable community. 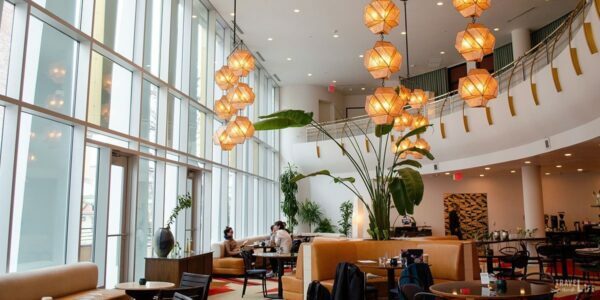 Selman Contemporary – A Durham-based advisory firm selected the artwork for the hotel to promote emerging artists working and living in North Carolina. Triangle artists include Ashlynn Browning, Martha Clippinger, and Heather Gordon. These limited edition prints were made through collaboration with Durham art studio, Supergraphic. 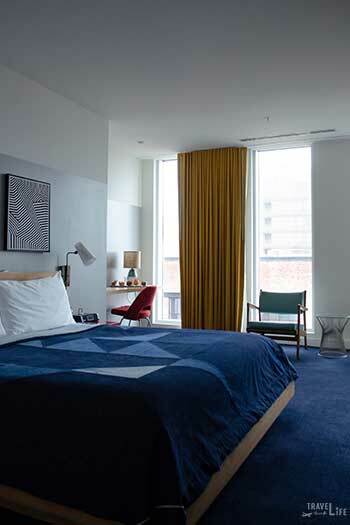 Raleigh Denim – Known for their handcrafted jeans, Raleigh Denim designed one-of-a-kind blankets for the guest rooms. They do all this while remaining to materials and maintaining the hotel’s colorful midcentury design. HAAND – The beautiful decorative items located around the hotel are sourced by a small company in Graham, Alamance County. HAAND is devoted to creating unique modern items through traditional methods. Burt’s Bees – Not many folks realize Burt’s Bees moved their headquarters to Durham’s American Tobacco Campus, which you can walk around. At The Durham Hotel, Guests can enjoy a selection of their natural award-winning products, such as the Beeswax Lip Balm and Hand Salve. 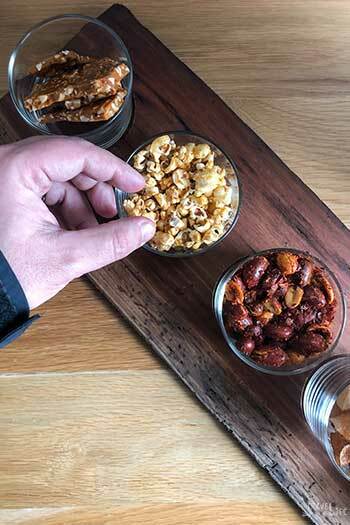 NC MADE – The mini bar snacks are curated by Durham-based NC MADE and are all locally sourced delicious tastes of North Carolina. Snacks include Apricot Pepita Nut Butter Bar and Peanut Butter from Big Spoon Roasters (Durham), Chocolate Bar from Escazu Artisan Chocolates(Raleigh), and Blister Fried Peanuts from First United Methodist Church (Mount Olive). The Durham features locally sourced food that represents North Carolina throughout breakfast, lunch, and dinner, The Durham also touts a coffee shop, rooftop raw bar, and exquisite craft cocktail list. So much yum going on here! 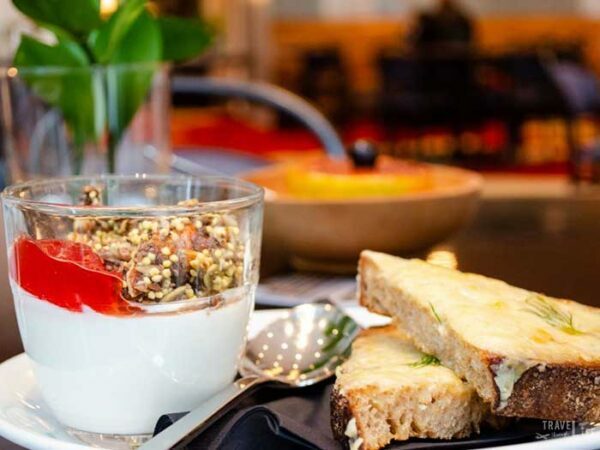 In the lobby, Hotel guests can enjoy a complimentary breakfast with an assortment pastries, house made yogurt, artisan baked bread, and Durham’s own Counter Culture-roasted coffee beans. If you want to go on an adventure through your cup, we recommend trying The Durham’s own Coffee Soda. 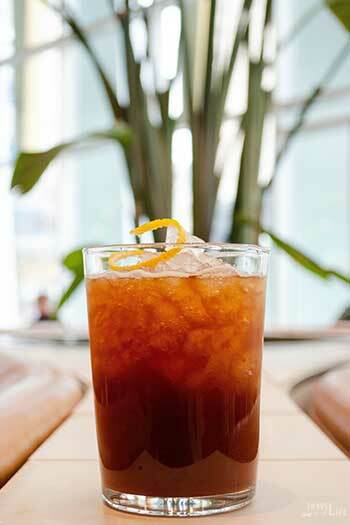 It mixes a delicious coffee flavor with a hint of orange to create both an uplifting and refreshing drink! Never too late for a Coffee Soda! 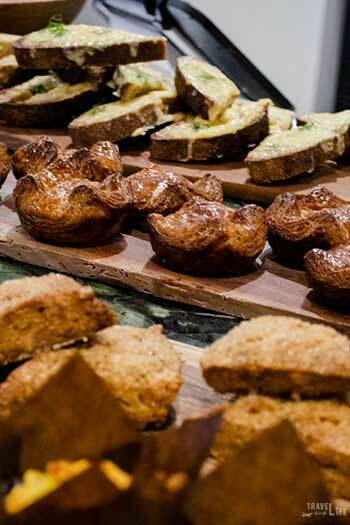 Lunch is no exception to the deliciousness coming from Chef Andrea Reusing’s kitchen. The menu changes seasonally to highlight North Carolina-grown produce and products. 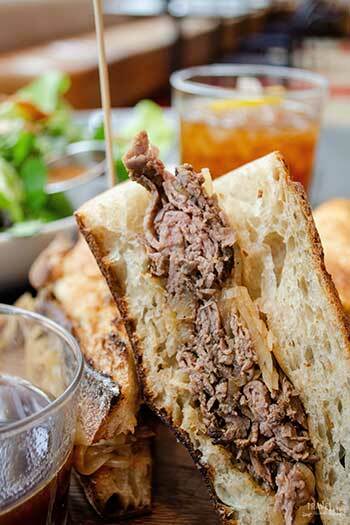 We decided to go for the French Dip Sandwich, which featured Raleigh’s Boulted Bread, dry-aged filet, soft buttery onions and a savory au jus dipping sauce. 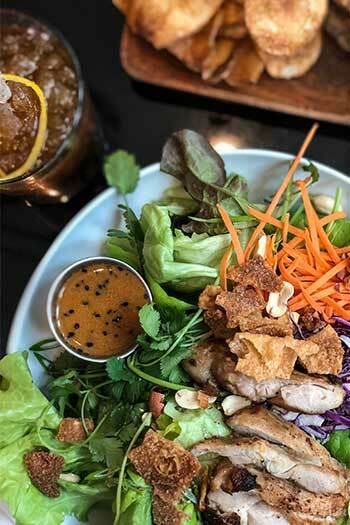 Our second dish included tea and spiced smoked chicken, wanton noodles, and local lettuces with a hot sesame ginger dressing. The Roof is a signature of The Durham that everyone from hotel guests to locals enjoy. During the winter months, it’s enclosed, heated, and adorned with soft cozy wool blankets. That way, guests can still enjoy views of the city. 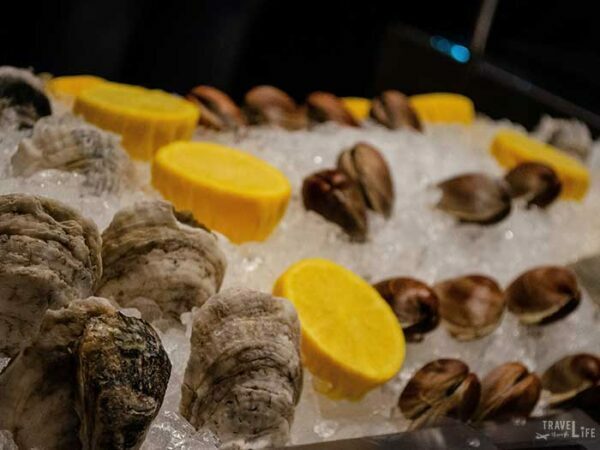 Whether you are dining on delicious North Carolina oysters while sipping a cocktail or getting your vinyasa on with Jessica Collette on Sunday mornings, the Roof is a must when staying at The Durham. Sundays on the Roof are a great time to enjoy a special menu offered by The Durham. 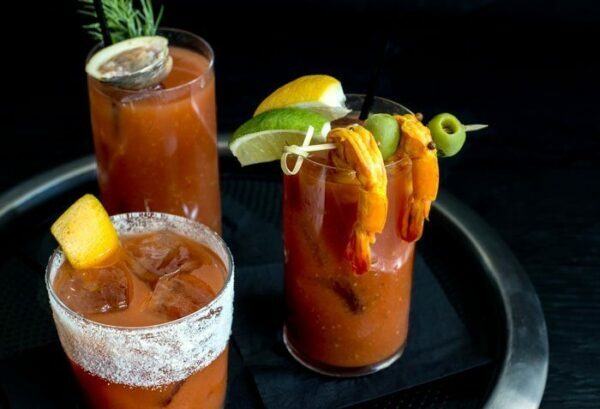 That’s when you can dine on NC Oysters, Wild Shrimp Cocktail, Fried White Oak Pastures Chicken Biscuits, and delicious brunch signature cocktails starting at noon. 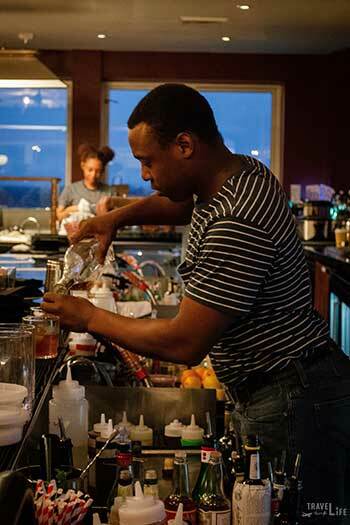 The craft cocktails are the worst-kept secret among Durham locals as a must-do for date nights. Couples and friends flock to the sixth floor right before sunset. That’s where they grab a drink and watch as the entire city is bathed in yellows, pinks, and purples. 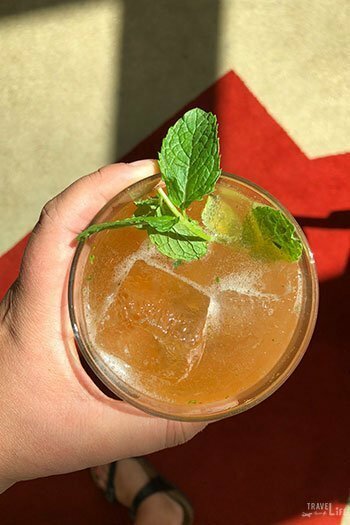 Some of the Roof’s delicious drinks include the Airmail (rum, lime, honey, prosecco) and Undeniable Truth (gin, dolin dry vermouth, orange bitters, EVOO, salt). NC Oysters on the Roof, anyone? I can’t finish writing about The Durham without mentioning the incredible attention to detail and focus on “local.” The morning delivery of freshly ground Counter Culture coffee really made my morning so much nicer. It was also really enjoyable to look around the room and see products that I recognized as being North Carolinian that really elevated my experience. My night at The Durham was actually a Momcation. I left the husband and toddler at home and took the night to recharge and get a solid night’s sleep. The Durham was the perfect spot for me to actually relax. I was able to easily walk around Downtown, order room service, and pop up to the roof for a cocktail. I leisurely woke up in the morning (at, you know, 6 am), brewed my freshly ground coffee, and drank it while it was still hot. After breakfast, I went up to the roof to meet Jessica for yoga. Along with a lot of really inspiring local yogis, I got to disconnect from everything for an hour. I know that many visitors from other parts of North Carolina and beyond are coming to stay at The Durham. 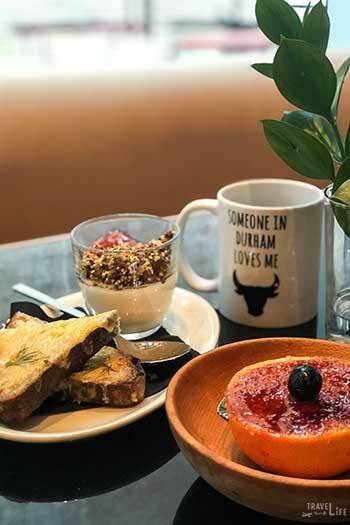 But if you’re feeling a night away and you live in Bull City, why not make it a Durham staycation here? The Durham Hotel has been a place that we’ve enjoyed on many occasions. We’ve dined and sipped cocktails throughout the year, attended Story Time on the Roof with my toddler, and co-worked in the coffee shop before. But checking in to The Durham really showed me just how unique and special this hotel is and how much I want to come back with my husband for our next getaway. 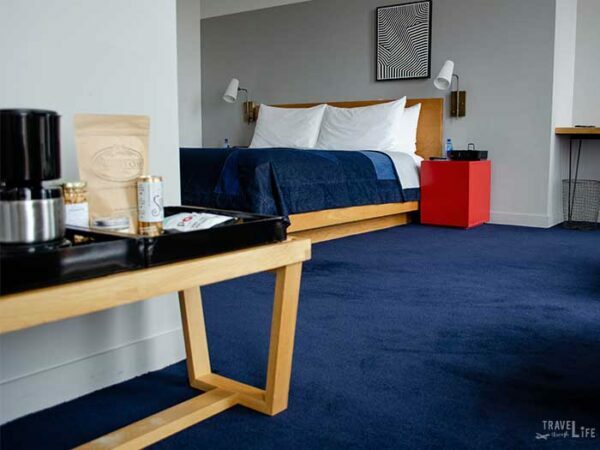 This guide to The Durham Hotel is part of our series of Hotel Guides, where we’ve covered favorites like The Cardinal Hotel in Winston-Salem, Inn on the Square in Greenwood SC, Proximity Hotel in Greensboro, and more. Special thanks to the Durham Hotel for providing us with complimentary accommodations. All opinions within this article are our own. This post originally appeared on NC Tripping. We poked into the lobby of The Durham during our last visit but the rest of the place looks amazing! Hope you can make it back for a stay. Call me so I can crash on your floor, too, ok? The carpet is super comfy. Thanks for commenting, Charles.